For years, construction professionals struggled to find a cost-effective way to work in swamplands, while responsibly protecting fragile natural ecosystems. Realizing the need for a more effective work tool, Huey Rivet, a contractor from Harvey, Louisiana, developed the Kori amphibious undercarriage. The first unit was matched to a standard 25 metric-ton excavator in the 1970's. Fully assembled, the machine weighed nearly 60,000 lbs. However, it exerted ground pressure just over one pound per square inch - less than a person walking. More importantly, because of Rivet's design, Kori amphibious undercarriages float. This allows Kori equipped machinery to travel unaided through areas where normal passage is limited to boats. From open water to stump-studded swamp ground, Kori handles it all. 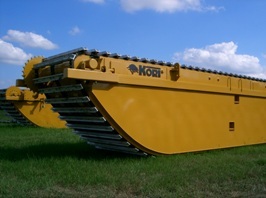 Kori's amphibious undercarriage also allows an excavator to maneuver in marsh and swamp areas without defacing the terrain. This is an important characteristic as contractors today are responsible for complying with strict environmental standards. In 2000, Kori was acquired by Sunland Construction, Inc., a large pipeline construction company serving the needs of major oil and gas companies throughout the United States. As a user of Kori amphibious undercarriages, Sunland Construction constantly tests the limits of these machines while Kori monitors performance, efficiency, and reliability. Adding to its product line, Kori amphibious undercarriages can now be customized to match any 6 to 50 metric-ton excavator available. They are also built stronger and tougher to handle more demanding jobs in the harshest conditions. © Copyright 2019, Sunland-Kori Services, LLC.